This portable camping cutlery set is easy to carry around and portable. Coming in a sleeve it holds two spoons, a Cutter and fork and a portable bottle opener. 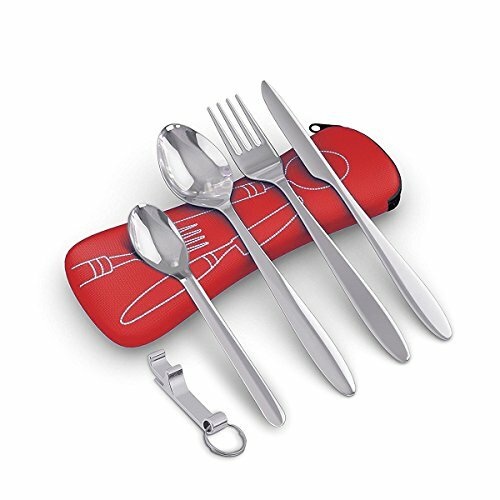 Compact Camping Set: The cutlery kit comes with a: Table Spoon, Tea Spoon, Fork, Cutter and Bottle Opener. Spoon - 175mm x 38mm. Teaspoon - 138mm x 31mm. Fork - 175mm x 24mm. Knife - 183mm x 15mm. Bottle opener 50mm. Space saving: This portable camping cutlery kit is perfect for reducing space and can easily slotted in a rucksack or pocket! Lightweight Sleeve: The neoprene pouch zip bag can hold the 5 pieces and has a zip at the top to close. It is compact and light being an essential camping accessory or used for festivals or travel due to its small size and lightweight. Warranty: Please contact us if you have any issues. There is a 100% guarantee on this!